We played the Zelda 1 prototype the other day on Poemato CX! I needed to get a few screenshots for my upcoming Zelda book, so we decided to make a stream out of it… and it turned out to be pretty cool and memorable! You can check out the full stream playlist here. You can read more about my Zelda book here and sign up for pre-order notifications here! 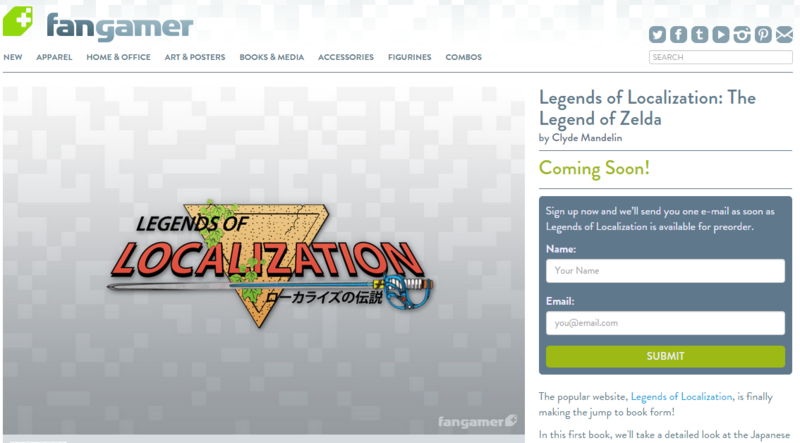 Poe and I have been working hard on our first Legends of Localization book with the folks at Fangamer. (BTW, sign up for pre-order notifications here!) The book features photos of a lot of rare Zelda merchandise, so we went and procured a lot of it! We’re planning on playing it on stream someday, and the chat will even get to play as a player or two! No definite plans or dates on when yet, but stay tuned and follow us on all the things in the meantime! Back in like 2006-2008, YouTube was just getting big, and I really enjoyed when people would upload game videos with commentary added. Even though I was SUPER shy and had no confidence in my speaking ability (especially when using a bad microphone and talking to no one in the room) I decided I’d try a video game commentary video of my own as a test. 2001: A Space Odyssey – I’ve read all four books in the Space Odyssey series, but the first one is my favorite. It’s slightly different from the excellent movie, but in the best ways possible. Angry Housewives Eating Bon-Bons – I’m not just into sci-fi, lol. This book follows the lives of five ladies over the course of about 30 years who start a book club together. A entertaining read. The Life-Changing Magic of Tidying Up – I’m also super into self-help books. This one teaches you a new method for clearing the clutter out of your life for good. It encourages you to keep only the things that “spark joy”. God of Cookery – A very silly kung fu movie about cooking. It’s by the same people who did Kung Fu Hustle and Shaolin Soccer. The Brass Teapot – A weird and entertaining independent movie about a couple who finds a teapot that spits out money whenever they injure themselves. Time Lapse – A time-travel movie about a group of twenty-somethings who find a machine that takes pictures 24 hours into the future. They exploit it for personal gain & there are consequences. I could go on and on, but that short list should be enough to keep you guys entertained for a bit! Also, Grandma’s Boy recently became available to watch on Netflix Instant streaming. That’s Poemato’s #1 favorite movie of all time, and we both highly recommend it. I was looking at old stuff and realized that today marks the 1 year anniversary of the day I showed off my first “stream magic” on Poemato CX! You might recall it was for Final Fantasy VI T-Edition, which was an amazing game by itself, but the whole poemato+game+chat connection really helped us level up our stream! Things have come a long way since then, and somehow I think it’s still going to go much, much further before long! Mato here! I’m still sick but getting better – I got a really bad cough too, so it might be a while until we’re good enough to stream without me blowing up people’s ears with my bellowing throat howls. Things are also starting to get mighty busy for us. We’re finishing up getting our new house, we got a vacation in a few weeks, my work is getting busier than ever, family stuff is going on, I still need to fix a million things on this server, etc. So streams might be a little light for a while 🙁 But if you’d really like, check out our old YouTube archives, maybe there’s stuff on there you haven’t seen before! Also, check out some fellow CXers’ streams too! A few days ago we held our second Famicom Exorcism, and since KingDarian was in town at the time, we let him pick the Famicom game this time! He eventually chose a game called Jajamaru Ninpo Cho, which almost got released in English as Taro’s Quest. It was fun and the music was bad – it was a memorable experience! As many of you know, Camp Fangamer was last weekend. Mato met and shook hands with hundreds of people, and as a result he’s come down with a post-con cold! It’s a pretty bad one, so we’re gonna take some time off from Poemato CX for a few days so Mato can rest and recover. There probably won’t be an EarthBound Central Live show tomorrow. Please tweet funny MS Paint drawings at Mato (@ClydeMandelin on Twitter) to help keep his spirits up!